This is how it all started. Our neighbor was throwing out two perfectly good Homecrest style patio chairs that just need a paint job and new covers. He said he had looked all over the Internet and couldn’t find replacement slings for them. 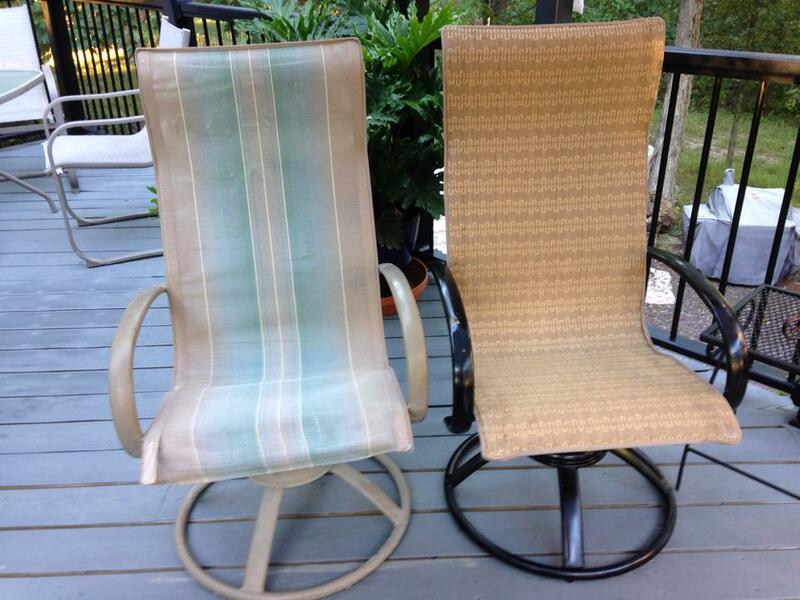 So, of course, since I just love getting something for nothing and seeing what I can do with it, we took those chairs. We’ve been using them as is and they are ohhhh, so comfortable. However, they really needed an update to go with our newly updated deck. I found fabric online for about $6.00 per chair and ordered it. I ordered about 2 1/2 yards of fabric (54″ wide) on clearance from: http://www.fabricguru.com/index.php?dispatch=categories.view&category_id=141 I ordered outdoor sling chair fabric. It all looked so easy! Ha! The chair lay in pieces on my newly updated deck for weeks. This is where the marital tension escalated. We finally spent most of one day going to hardware stores looking for something that might work. We finally found it at Ace Hardware. I don’t know what name of the thing is, but we found it in the lamp department and it is a long, hollow metal rod of some kind with the right diameter (to fit over the screw) he was looking for. I think i’s purpose is for lamps. We bought it for a couple of dollars and he went home and bent it in the shape he needed. And that’s where everything stayed for another couple of weeks. Marital tension escalated yet another level. My newly updated deck was still covered in chair parts. Finally, this weekend he was able to have our son, Trevor, help him with the man power requirements needed to bend the second bar. At that point, he thought he was finished spreading and Trevor went home. Unfortunately, marital tension mounted again when I realized there was another bar that had needed spreading. He tried to go it alone without success. I agreed to try helping and believe it or not, we got it in place. He was able to put everything back together correctly (after one false attempt, which caused yet another marital tension escalation). For $6 in fabric, a can of black spray paint, less than $2 for a lamp part turned spreader tool, and a good supply of marital tension, we now have a newly updated sling on one spring/swivel patio chair (Homecrest style) that looks better and is still very, very comfortable. I’ve rocked myself to sleep in it several times. The question now is: Will our marriage survive the second chair???? It was exciting to learn and see how you made the slings for the Homecrest chairs. The chair looked great! Did you ever get your second sling done? 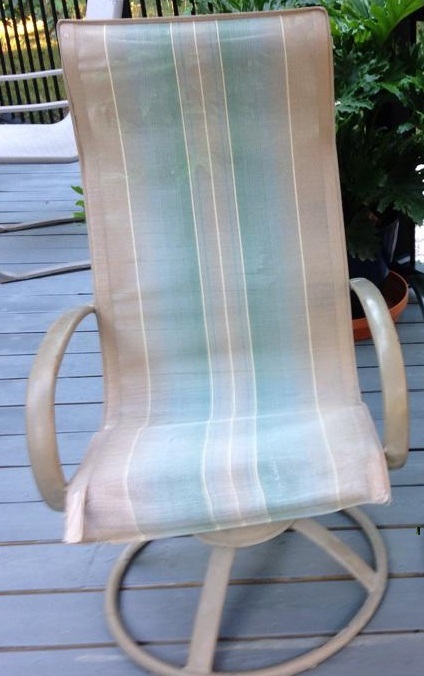 I have been wanting to sew replacement slings for my Homecrest chairs too. What I am not sure about is how much smaller do I make the sling than the actual size of the frame. I know how to measuring when ordering new slings. What I would like to know in order for the fabric to be taunt- the width should be slightly smaller than the actual width of the chair. Do you know how much smaller you made slings? I think I will just order the special tool to install the spreading bar. Thanks, Ivy! I must confess we never did the other chair. Having the real tool might have been an incentive. : ) I used the old cover for a pattern so I don’t know the dimensions. I’m sorry I can’t help you there. I found a site that showed the chair we had in which you could order the sling and didn’t have to measure. That wold be the correct size as they would take that into consideration. Did you see that site? Hi there, I read each link provided but the video for the DIY is for a single layer sling mesh, and I have the exact same chairs you have. Mine appear to be 2 layers with channels on the sides to slide over the frames. Did you duplicate this dual layer mesh or did you make it single layer like that YouTube video with the striped sling mesh? Thank you very much! Sorry for the late reply. Mine was double layered. I reused the binding from the old covers and sewed them together. On the bottom, I didn’t so completely shut but made it kind of like a pillow case cover. Then slid the whole thing over. It wasn’t easy but it worked.